Arctotis are a useful plant if you are looking for a tough free flowering ground cover. With many hybrids offered for sale the colour range is ever increasing. With large flowers Arctotis have daisy like flowers and are originally from South Africa, hence the name ‘African Daisy’. Large flowers above the foliage, they are a hardy perennial suitable for the border or as a ground cover. 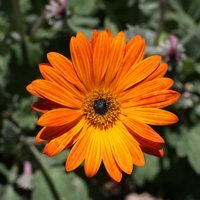 Arctotis flower in early summer with blue, red, orange or peach coloured flowers, and a second flush of flowers in spring, provide good drainage and cut back spent flowers. Low growing reaching around .2m they can cope with low temperatures however they do a lot better in warmer positions. Try growing Arctotis on dry sunny slopes as a ground cover. Use them in containers to underplant taller plants, or grow them in the border. Arctotis require little care and in fact will self seed, so if you do not want then to take over, dead head after flowering and simply pull out the ones that are spreading ‘ out of bounds’. They will flower summer long so are an attractive addition to the garden. For best flowering use an all purpose slow release fertiliser in spring. A little additional water during dry summers can improve flowering. Arctotis do not need regular pruning, however will benefit from dead heading. As they spread, clumps can be pruned back to the required size. After a few years in the garden, you will need to dig the clump up and divide it. Dispose of the oldest woody parts of the plant and use the newer growth to replant. Propagate is easy from both seeds and cuttings. Available for sale at most nurseries. Spread – Will spread to around 50 – 70 cm metres and more depending on variety. Soil – Humus rich well drained, however tolerant of a range of well drained soils including sandy coastal soils. Flowers – Mainly in shades of yellow and orange to red.